“After cut the child in two equal halves and then given one half to each of them. On hearing the order one of the women began to wail. Throwing herself at the feet of the King she said, “Please, don’t cut the baby, give the child alive to the other woman. I don’t claim the child. “The other woman remained silent. So, King Solomon could make out who the real mother was and handed over the child to the wailing woman who was the real mother. The false mother was duly punished. Solomon son of King David was a superior and righteous person. One day Solomon had a dream. God: Solomon, ask for anything… anything you want. Definitely, I will fulfill. Solomon, young and humble spoke to God. Solomon: I know great responsibility is involved in governing God’s people. Therefore, I pray to you that I ask for wisdom sufficient for doing the job. God: I am pleased with your request. Solomon: Thank you, my lord. God: You might have asked for wealth, political or military security, long life or fame but instead you asked wisdom to carry out the responsibilities given to you. Therefore, I will give you exceptional wisdom, unlike anyone else before or after you. I also give you wealth, respect and security, which you did not ask for. 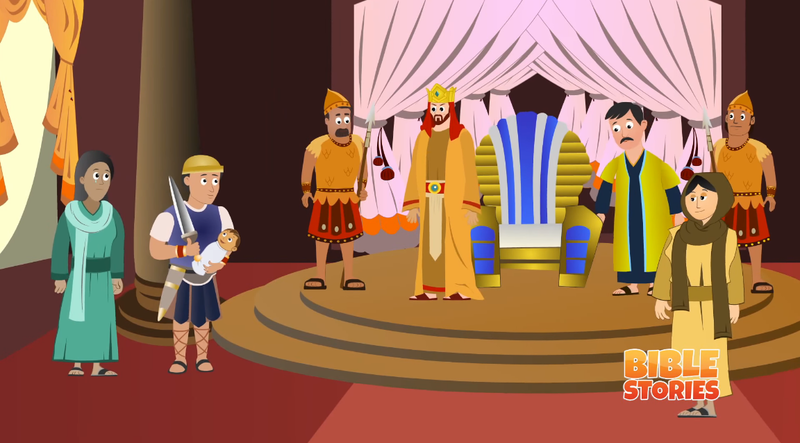 As promised, God gave King Solomon exceptional wisdom. One day Solomon happened to judge a case of unusual difficulty. Two women came to King Solomon, applicant and defendant, each has a baby. One baby had died, and the other one was alive. Women: O Great king, I am the mother if serving child who is in her hands. Each woman claimed to be the mother of the serving infant. The crowd, which gathered in the court, was eager to know how the king would judge the case. Solomon: (To himself): I know clearly one woman is lying, but who is that? I have to be very careful in delivering the judgment. King thought for a while. Solomon: Who is there! Bring me a sword. There was a murmur in the crowd. A servant brought a sword. Solomon: Now, I order you to cut the child into two parts and give one-half to each woman. The crowds were stunned with the cruelty of this court order. The woman who had filled suit could not bear to see her child killed. Woman: O great might king. Please withdraw your order. I will withdraw my suit, you can judge in favor of my opponent, but please spare my child’s life. I cannot see my child being killed in front of me. Womam2: I like the king’s decision. Cut him in two half! Solomon: I withdraw my order. I order that the living baby is given to the first woman. She is his mother! Wooman1: Thank you, my great king. Solomon’s wisdom was immediately obvious to everyone present, and his reputation spared throughout the kingdom. God has indeed kept his promise. King Solomon’s became a legend. His power of wisdom started to spread around. Queen of Sheeba: I wonder how a person can be so wise. I will test his knowledge and wisdom myself. So Queen of Sheeba sent a word to King Solomon about her visit. King Solomon: The queen of Sheba is planning to visit our kingdom. Let us welcome her in a very grand manner. Queen of Sheeba met King Solomon. King Solomon: Hearty welcome to the queen. Queen of Sheeba: Ho great king, I come myself to test your wisdom and knowledge. King Solomon: I am ready to take up your test. What is it? Queen of Sheeba: I have two bunches of flowers in my hands. One brunch is of freshly harvested flowers. The others brunch is artificially one made by the experts which looks like real one. King Solomon: I understood, please proceed. Queen of Sheeba: Now you have to tell me which one is the real flower. The one in my right hand or the one in my left hand. King Solomon through for a while. King Solomon: I find it very difficult. How will I find the right one? I am very much confused how do I find it. He closed his eyes and suddenly remembered an incident. King Solomon (To himself): I have seen few bees buzzing around the flower. Bees are attracted towards the honey in the fresh flowers. So this will definitely work out. 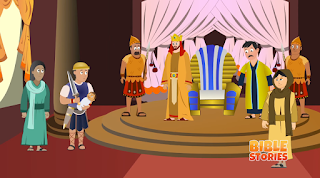 King Solomon: Who is there? Please open all the windows. A servant opened the window. Few moments passed. Everyone saw two been flying through the window. Queen of Sheeba was wondering about the act of the king. The bees sat on the brunch of flowers held in the right hand. King Solomon: The flowers on your right hand are the fresh ones. Queen of Sheeba: Excellent! I still have certain difficult questions to put before you. King Soloman: I am ready to answer your question. She asked all her difficult question, and Solomon answered them all to her satisfaction. Queen of Sheeba: I am deeply impressed with your wisdom. The king gave her gifts fit for a queen, and she returned home.